Another eventful week coming up, especially in the world of basketball and running! Villanova is 0-0. The beauty in that is simply put – anything can happen. Friday night marks the opening night for the regular season of basketball. The men’s team will travel to the new PPL Center in Allentown, PA to play Lehigh University. It will be the first of many games to come, as Villanova begins its journey to defend their regular season title. They enter the season ranked #12 on the AP Polls and will look to recreate and exceed last season’s success. The Lehigh Mountain Hawks finished last season with a record of 14-18. They were eliminated from the opening round of the Patriot League Conference Tournament, leaving them with a four game losing streak to end their season. The Mountain Hawks will surely be looking to correct it and start the season anew. They will be led by Corey Schaefer, the only person who started all 32 games for Lehigh last season. Stay tuned for a more in-depth preview to be published by tomorrow morning. The women’s basketball team will also hit the road to start their season. However, they’re going a little farther away, to Chattanooga, Tennessee. They are playing in a small tournament this weekend, squaring off against the hosts for their first game. The Chattanooga Mocs finished 29-4 last season and landed onto the NCAA Tournament field as an 11-seed, where they fell to the Syracuse Orange. After facing Chattanooga, Villanova will take on South Florida on the following day. The Wildcats missed out on the NCAA Tournament last year, but made it to the WNIT. They beat Quinnipiac 74-66 in the opening round, before losing to George Washington. Villanova will look to start the season off on the right foot in Chattanooga and hopefully work their way back to the NCAA Tournament by the end of the season. The last time they made it to the NCAA tournament was two seasons ago. The Villanova football team was back to their winning ways last week, dominating Towson 42-14, thanks to a brilliant second half effort. The Wildcats moved up to #6 in the rankings for this week, thanks to losses by North Dakota State and McNeese State. They will have another game under the lights, this time against Albany (6-4). It is the final home game of the season for the Wildcats, and with that comes Senior Day. Villanova will honor 17 seniors on Saturday night. Albany is coming off of a close loss to Delaware, in which they lost 31-28. The Great Danes will test Villanova’s passing defense, Will Fiacchi had a wonderful game last week against Delaware. However, it will be interesting to see which Will Fiacchi will show up on Saturday, as he has been inconsistent this season. Check back tomorrow for a preview of Saturday’s game. Kickoff is at 7 p.m. The Cross Country team will take their talents to Penn State this weekend for the NCAA Mid-Atlantic Regionals. The men’s cross country team posted another dominating performance across the board at the Big East Championships. They captured their second consecutive Big East title and their third in the last four years. The men’s team will be led by Patrick Tiernan, Sam McEntee, and Jordy Williamsz, who swept the top three individual spots – finishing one, two, and three, respectively. 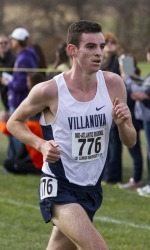 Tiernan repeated as the individual Big East Conference champion. Competition will begin this Friday, November 14th, at 12 p.m.
Emily Lipari graduated last year and closed out her decorated career as a national champion. So far, it seems that a newcomer is on the trail that Lipari left behind. Freshman Siofra Cleirigh Buttner helped lead the Wildcats to a fourth place finish at the Big East Championships. Her individual finish at 12th place was the best finish by a freshman since Lipari finished 11th in 2010. While there’s still a long way for Cleirigh Buttner, whose Villanova career is still just beginning, that’s some good company for the young runner who hails from Ireland. The women’s cross country team will also attend regionals this Friday, November 14th, at 12 noon.